A new study from scientists at Brown University offers an explanation as to the existence of plate tectonics on Jupiter's moon Europa. This process could be crucial in supplying chemical food for potential life that may exist within the moon's subsurface ocean. Using computer modelling, the researchers showed that subduction - the sliding of one tectonic plate beneath another - is physically possible in Europa's icy shell. 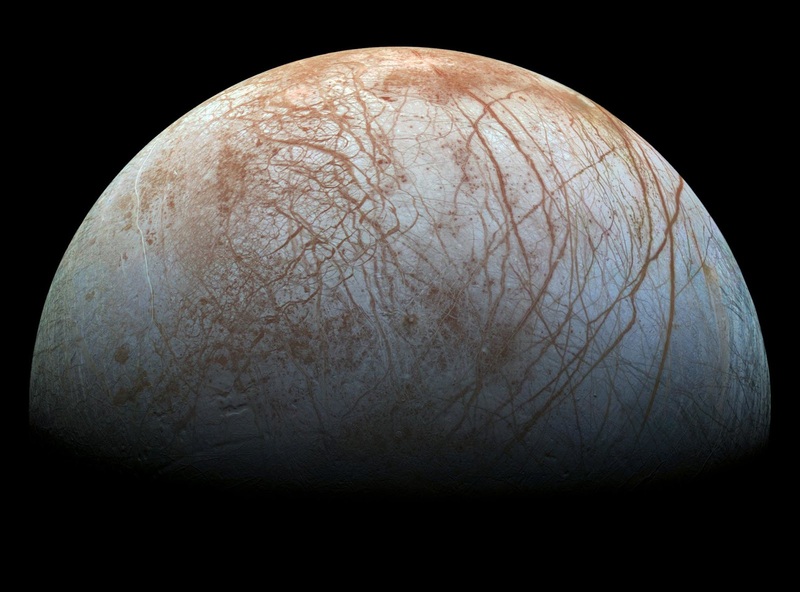 This data bolsters earlier studies that found regions of Europa's ice shell that looked to be expanding in a way similar to the mid-ocean spreading ridges on Earth. The model, which functions regardless of temperature differences, showed that if there were varying amounts of salt in the surface of Europa's icy shell, it could provide the necessary density differences for a slab to subduct. Part of the excitement from this new study is that surface crust is enriched with oxidants and other chemical food for life. Subduction could provide a way for that food to come into contact with the subsurface ocean that scientists believe exists underneath the moon's ice.